RABCA is an active club of bottle enthusiasts that has been meeting regularlyly since 1970, now in the Dale Ruritan Club building, off of Rt. 10 just south of Chippenham Parkway (see map below). We meet on the 2nd Wednesday of February, April, May, September and November. The June meeting is a picnic. In November we have our annual "Best ..." where members bring in their best bottles from the last year to compete for ribbons in a number of categories, and we have a dinner in December. We have a program at each meeting, a raffle for bottles, and members bring in recent acquisitions for Show & Tell. Of course, there is always a lot of great discussions about bottles. Visitors are always welcome. Rick McCormick is the club president, Tony Townsend is the VP, Marvin Croker is our treasurer, Carla Garris is the secretary and the co-show chairmen are Marvin and myself. Click here to email me or call (804) 739-2951 if you want more details about our meetings or activities. As well as the 5 regular meetings we have a picnic in June and a Christmas dinner at a local restaurant. Our picnic is always especially fun as there are activities such as a club raffle and an auction for members to sell bottles and go-withs. Among this year’s raffle bottles was an iron-pontiled scroll flask. This year we had around 40 people show up for the burgers, hot dogs, all served with a good helping of bottle talk on the side. There are pictures of this year's picnic at the top of this page. As usual, club member and bluegrass/gospel musician, Jimmy Wooten, provided background music for our enjoyment. Each club member can put as many as 10 lots up for auction and this year’s bidding brought in more than $750 to sellers, the club getting 10% of each final bid. The first Saturday in October is always our annual bottle show. For 2019 the show will again be at the Chesterfield County Fairgrounds and our next show will be there on Oct. 5, 2019. It is a great place to see bottles of all types being sold by dealers from all up and down the east coast. Plan now to attend next year. Former dealers will be sent a contract in late June, and potential new dealers should contact us about table availability and getting a contract. The basic information is on the flyer (left). It is great fun with lots of bottles, go-withs and people who like to talk about bottles. 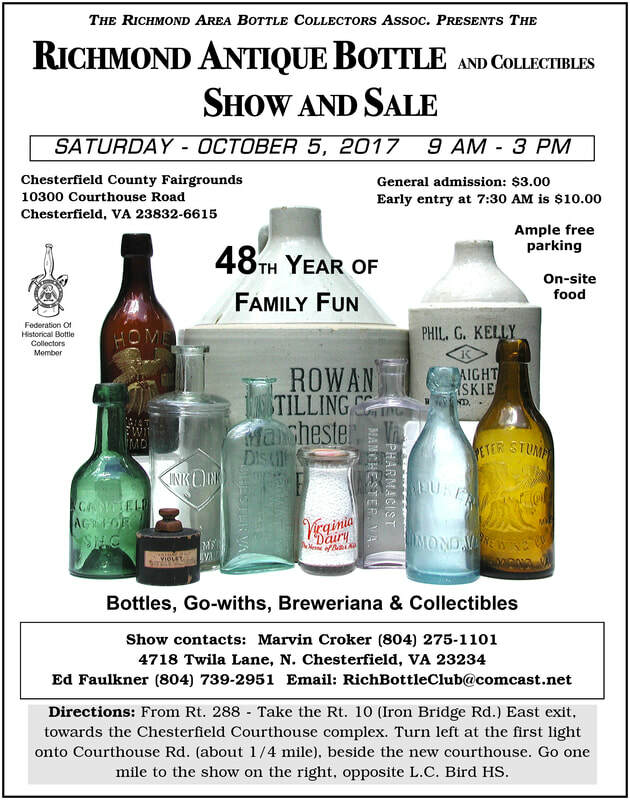 You can call me (Ed Faulkner) at 804-739-2951 for more info about the club, the show or any questions dealing with bottle collecting. I’ll be happy to talk to you about any of these. 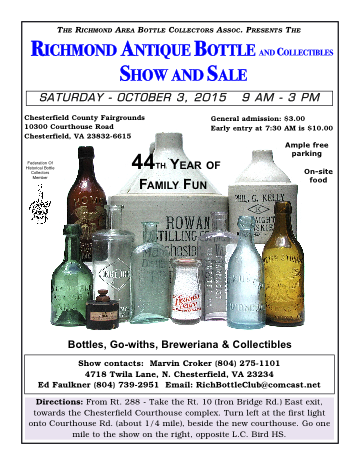 Club member Reggie Lynch has a good web site (﻿antiquebottles.com﻿) that has a lot of information on bottles, shows and other items of interest to bottle collectors in general. 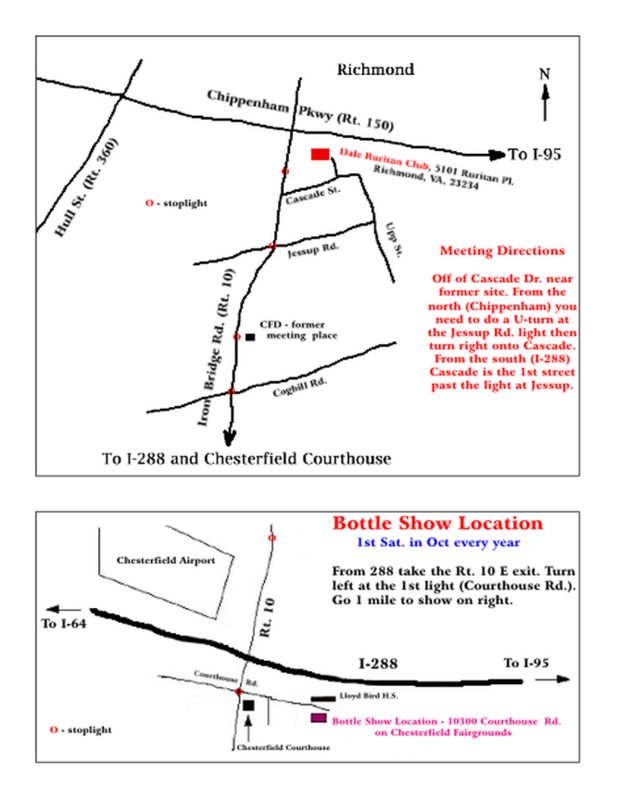 Another member, Rick (Meech) Burchfield also has a good web site with info, pictures and ideas about digging bottles. We are now on Facebook thanks to Tom Leveille - just log on and do a search for the Richmond Bottle Collectors Association. Another good source of bottle related information is the national organization, the Federation of Historical Bottle Collectors (FOHBC). Their new web site has a number of bottle related areas and is still being developed.